Olive OPUS Nº5 Karim Rashid Editions | OhGizmo! By Andrew Liszewski on 12/05/07 • Leave a comment! Are you tired of the rather limited choice of color when it comes to home theater components? Basically it’s black, silver, or go out and buy a can of spray paint. And while I actually prefer black so everything disappears when the lights go off, I can appreciate the desire for something more original like the Karim Rashid Spring ’08 Editions of Olive’s OPUS Nº5 digital audio server. I’ve never heard of the guy, and while he looks like just another designer with a shaved head and thick-framed glasses, I do like some of these designs. 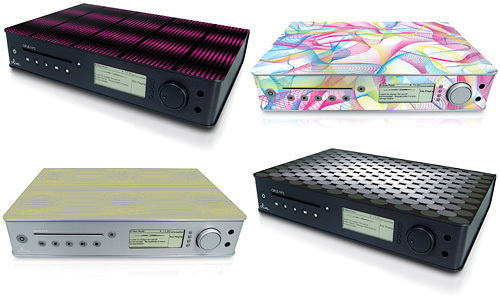 They were apparently created “with a repeated element symbolic of binary notation for a perfect container of sound.” As for the OPUS Nº5 itself, it’s another digital audio server that’s aimed towards the audiophile crowd in terms of sound quality and price. It includes a 400, 500 or 750GB hard drive and converting a CD is as easy as sticking it in the slot and hitting a button. The OPUS Nº5 even has a built-in database of more than 2,400,000 albums which means if you don’t have internet access, there’s a good chance it already has the data for the CD you’ve just ripped. The OPUS Nº5 starts at $2,999 for the 400GB version in Silver and goes up to $3,999 for the 750GB version in black. The Karim Rashid editions only come in 750GB versions for $3,999 each.